Riley Osborn, 2, was given little chance to live based on complications of being born at 23 weeks gestation. 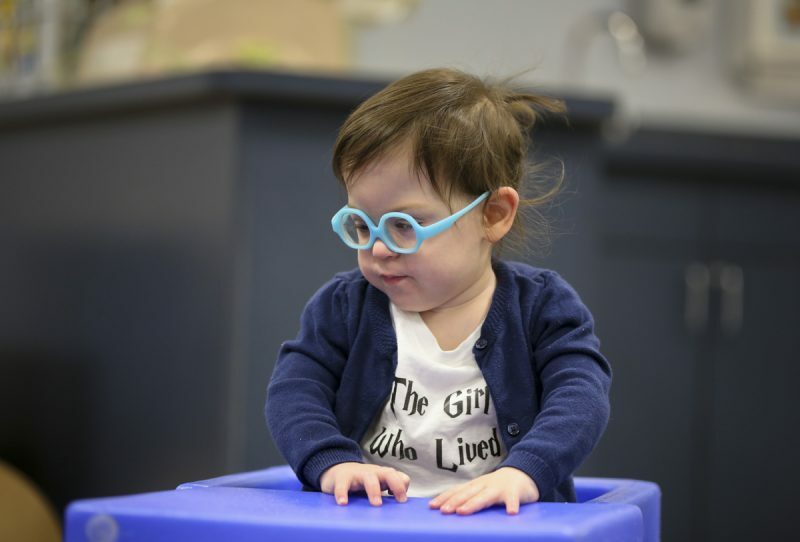 But with help from Akron Children’s NICU, occupational therapists and lots of encouragement and practice at home she’s been able to accomplish many goals. Who says miracles and magic aren’t real? Just ask 2-year-old “wizard” Riley Osborn and her parents. From the day she was born – at 23 weeks, 6 days and weighing just a pound and a half – Riley has been proving her doubters wrong at every step – literally. Riley spent the first 130 days of her life in the Neonatal Intensive Care Unit (NICU). The difficult and early delivery led to a brain bleed and cerebral palsy diagnosis, and it had clinicians managing the Osborns’ expectations that their baby may end up blind, deaf and unable to talk, walk or eat. Adding to the Osborns’ pain was that they lost Riley’s twin, Finley, a few hours after delivery. The next few days would be critical, doctors said, and there was a chance she may not make it through the weekend. Having dreamed of reading together, Josh Osborn, Riley’s father, read her the book Harry Potter and the Sorcerer’s Stone, a story about a boy who faced nearly impossible odds and lived. Coincidentally, Riley started improving. “They were shocked when she made it through the weekend, and she kept surprising us week after week from there,” Megan said. 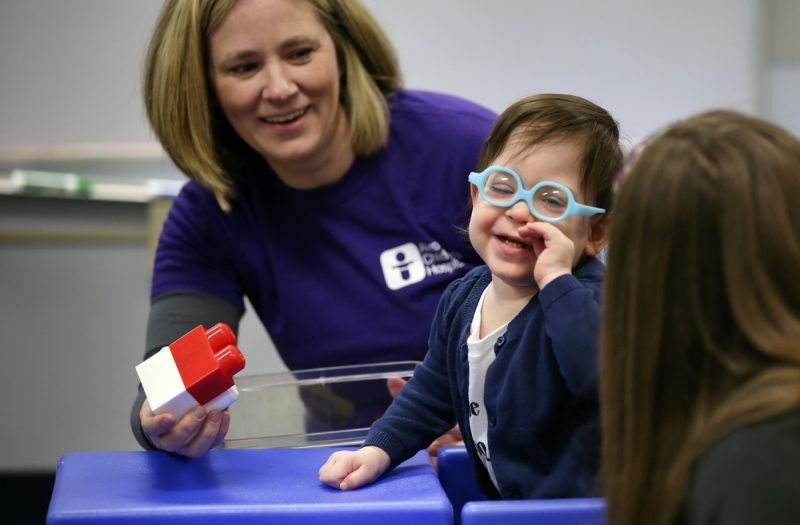 April is National Occupational Therapy Month, and Akron Children’s Hospital Mahoning Valley occupational therapist Nancy Hanek has been helping Riley, of Columbiana, achieve milestones since she was in the NICU. Hanek works with Riley on a weekly basis to help her increase strength, and improve her fine motor and visual motor skills. She has Riley working with grasping and positioning puzzle pieces, and using 2 hands to accomplish tasks like reaching above her head to place a basketball through a hoop. In-between therapy sessions she gives Riley’s parents homework to continue her development. 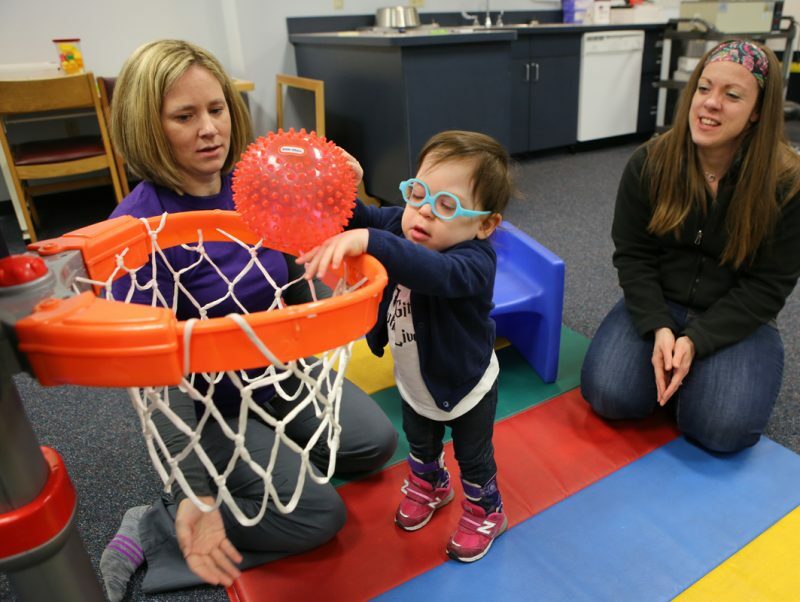 Occupational Therapist Nancy Hanek has been working with Riley Osborn on tasks requiring the use of 2 hands as part of her therapy, which the determined little girl considers a slam dunk. “Nancy told us early on if we treat her like any other kid she’s going to rise to the occasion, and that just changed everything for us,” Osborn said. Hanek has seen marked improvement in how Riley has progressed in a relatively short time. In the past few months her walking has greatly improved, to the point where she’s taken as many as 8 steps at one time. And who knows what she’s capable of next. 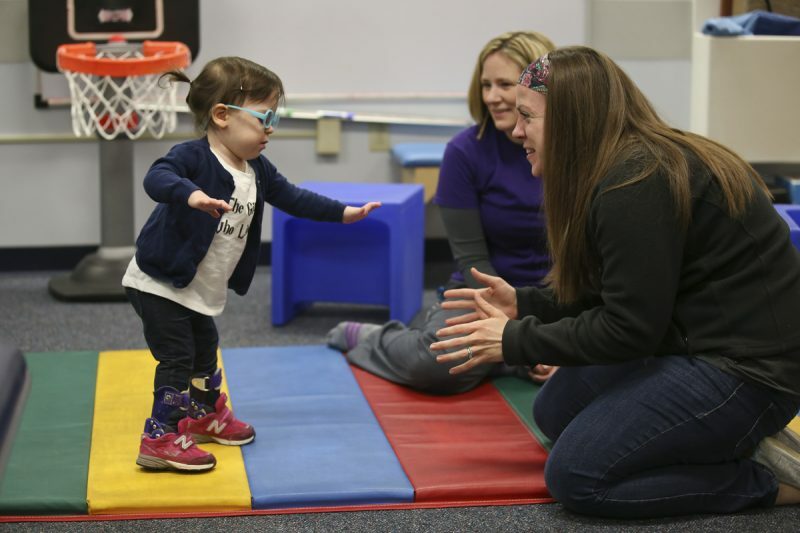 Here Riley’s mother Megan (right) and OT Nancy Hanek encourage her to walk during a therapy session. She’s already inspiring other children. And adults.